the locals in the area go. 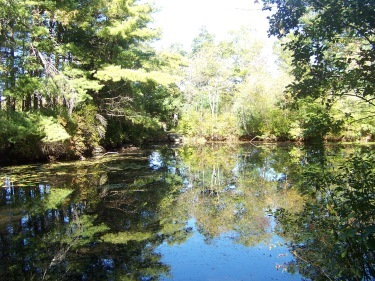 The trails here are a mix of sandy dirt roads, sometimes around working or abandoned cranberry bogs and paths in forested areas encircling assorted sized ponds. If you find this area on google maps it contains no information pertaining to a wildlife management area. You will find Upper and Lower Burrage Pond and a collection of separate ponds grouped together to the west of Burrage known as Indian Trail Reservoir. After visiting the area for the first time I felt that the property consisted of these two areas separately, yet together as one. My trips to the area are mostly from the access point on Elm St. across from the Smith-Nawazelski Conservation on an unmarked paved road the town calls Hawks LANE. also known as Indian Reservoir and it's hiking trails. 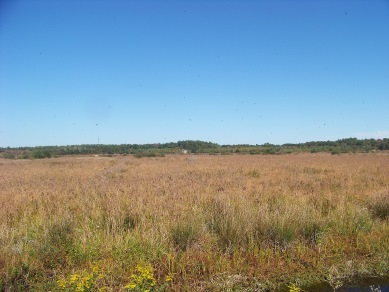 Secondly the Eastern part of the property containing Upper and Lower Burrage Pond with extensive cranberry bogs and trails around them. It is here, at the Indian Reservoir, that the Elm st. entrance, brings you closest to. Another parking area on Hawks AVENUE off South Pleasant St. will bring you directly to the Burrage Pond side with the accompanying cranberry bogs. 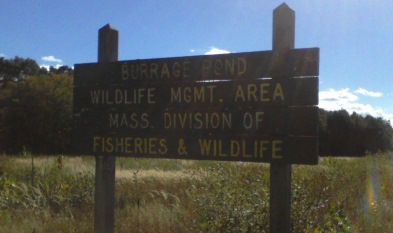 Burrage Wildlife Management Area aka BWMA is managed by the Mass. 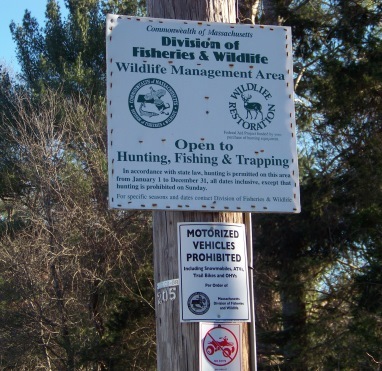 Division of Fish and Wildlife. Upon looking at an older map of this area you will notice that the entrance on the unmarked lane into the property , Hawks Lane, was not part of the BWMA. 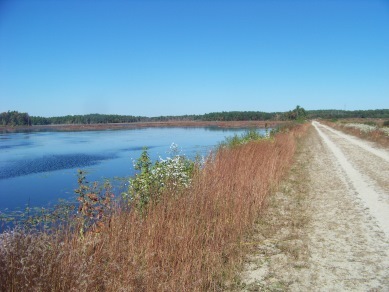 Neither was the cranberry bog upon entering, portions of the historic Indian Crossway, nor the ponds that group together and are known as Indian Reservoir or the trails around them. Older information on this property says it contains 1638 acres of land. Newer maps now show all these areas as part of the BWMA and claim that currently 2014 acres exist. 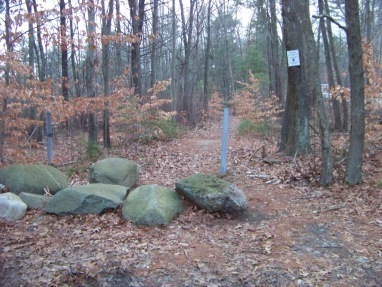 On google maps the historic Indian Crossway is shown as Crocker Place and connects to this sides' main entrance into the management area. This is the route the Bay Circuit Trail takes through this property. Shortly after the cranberry bog on the left you will find a small powerline which also exits to the left. A cart path runs up the side of the powerline and once heading down you will find the usual white rectangles that mark the Bay Circuit Trail. There is no evidence at the head of this hiking trail that it turns here. More than half of the BWMA is in the town of Halifax but that towns' former parking and access point is in some sort of dispute with an abutter of the property who has not been treated kindly by some after hour visitors of the BWMA. It seems the access point is on the abutters' property and with no help managing abusers of the property, til some mutually equitable arrangement is agreed upon, that access point remains closed. 968 acres lay in Hanson with two access points to the property. The other access point on Hawks Avenue seems to be the main entrance. This is a rutted dirt road. Drive past the garage building. There are a couple areas to the right to park at and a small parking lot that can hold about 10 cars on the left. You will find an information Kiosk as well. the Hawks Lane entrance to park at. Though parking may be limited. 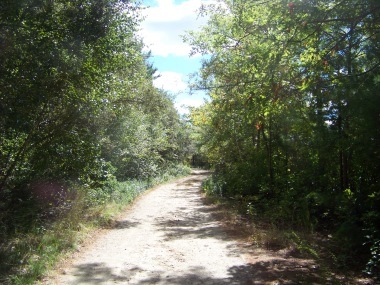 One road side area has a short path to one of the Lower Indian Reservoir ponds. 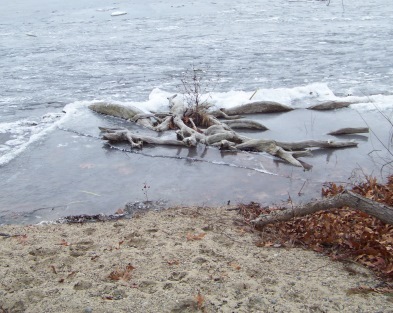 Great place to put a canoe or kayak in. 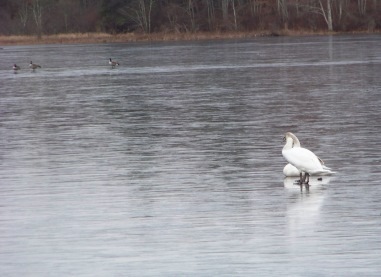 It appears easy to portage over to other ponds once in. Earlier when I visited the hiking trails between these ponds, I had noticed several areas where this would be easy to do. 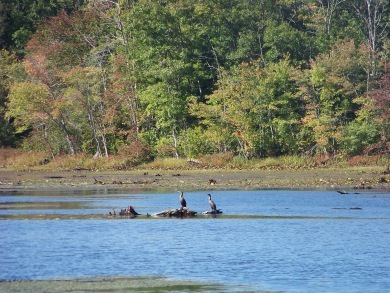 The part of the property that lies in Hanson is of the area called The Great Cedar Swamp. Formerly the area was diked and made into Cranberry bogs. In 2002 the Division of fish and Wildlife bought the original 1638 acres from the Northland Cranberry Company. Land acquisitions since then have filled it out to it's current size. 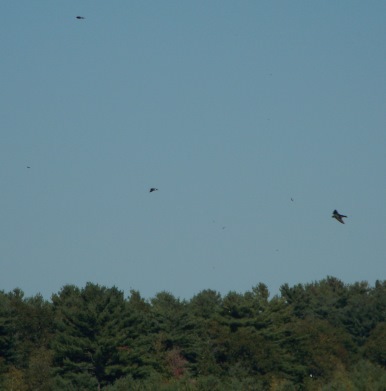 populations of yellow perch, largemouth bass, chain pickerel, golden shiner and black crappie can be found here. Bird Watching: there have been found up to 81 species here at one time. The hiking trails here can be an all day event if you have the time. I have done a series of 5-6 mile hikes and that only covered portions of the area! 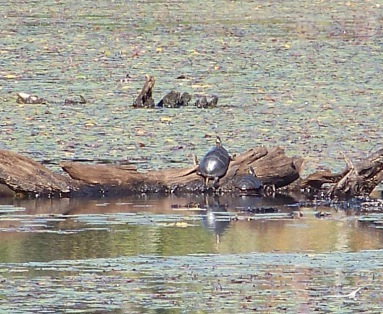 If you are looking for something much smaller, then following a trail either around a cranberry bog or just down the length of one or both Burrage ponds can be short enough. There is a picnic table at the far end of Lower Burrage Pond to rest at or take in refreshments you may have brought with you. 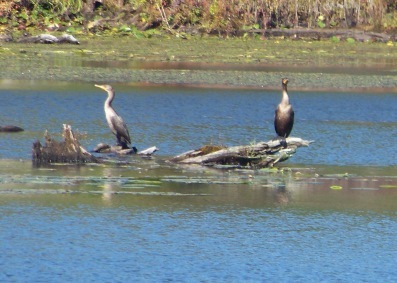 other wildlife in the area. Though in any season and almost anytime here at BWMA, you can find a variety of feathered friends on these hiking trails. seeming to play above this area! 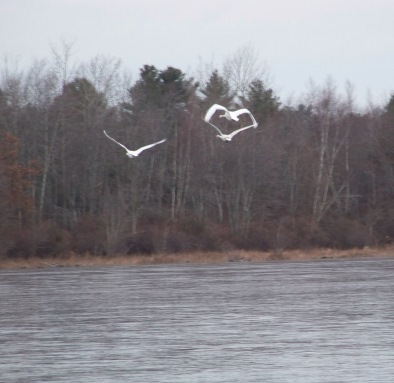 Winter is just as interesting at Burrage Wildlife Management Area too! All directions to trail parking use route 3 as a starting point. This one is difficult! I usually like to use mostly major routes to direct those not familiar with the area. In this case there would be many miles added. Follow through two sets of lights, then take Water St on the left. Follow Water St to it's end and left on Route 53. At the next set of lights take the right on Route 14. Follow Route 14 through Pembroke Center. It will take a right onto Mattakeeset St.
Continue following til Route 14 takes a right on Maquan. HERE you will go straight and continue on Mattakeeset St which leads you to Bryantville and Route 27. Take a right on Route 27. Straight through the lights intersecting Route 58, the next left is Pleasant St.
Main Entrance is on Pleasant St. Instead of taking the left on Pleasant St, continue on Route 27 following through Hanson Center. Approx. 1/4 mile after the Commuter rail, Elm St will be on the left. The smaller parking area will be about 1 1/2 miles down on the left. Elm St entrance can hold up to 6 cars with additional spaces across the street. South Pleasant St. entrance can hold up to possibly 16 cars. This map shows only the most prominent trails. Those shown on this map except for the Indian Crossway are the wide dirt road trails. Many are not shown here. They are the connecting paths.